Is Fear Preventing Realization of your Dreams? I asked myself this question six months ago as I was enjoying a work sabbatical, spreading my wings and stretching my boundaries of what life as I knew it looked like and felt like. The answer? Yes, fear was holding me back. I was actually quite surprised by the answer. Here I was, a successful woman, mother of two, loyal friend, daughter and sister. From the outside, many would say I looked polished and complete, the picture of happy. However, the feeling in my gut was more of a less than, not quite worthy of the appearance I gave off. As a Lifelong learner, always seeking to understand why, I dug deeper to understand more, taking stock of where I had been and unpacked the reasons why. As I took stock, I acknowledged the previous season of my life had culminated in me feeling fully authentic in my personal life. 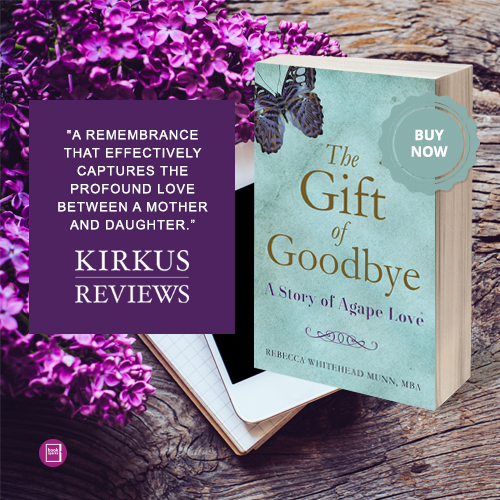 You can learn more about my personal journey here: https://rebeccawmunnauthor.com/the-gift-of-goodbye/ . I was fooling myself to believe I was done, as if authenticity was an event, something I checked off on my to-do list. Authenticity is a process– of choosing your thoughts and actions that are most aligned with the creative being you were designed to be and a practice– a daily commitment to stay true to you as each day unfolds. As I awoke on November 1, I was feeling anxious about all the things on my to-do list that remained undone. You see, I am a recovering perfectionist and this feeling cut deep in my core, as feelings of not being good enough and not measuring up surfaced. I closed my eyes, sat with the feeling and quieted my inner critic. As I breathed deeply, I acknowledged the why my to-do list remained. In my new practice of enjoying the little pleasures of life and living more in the moment, I had prioritized visiting with friends as we greeted trick or treaters the night before. Earlier that day, I had re-opened the carton of Halloween costumes from my children’s younger years, several hand-made by my mother, some twelve to fifteen years before. The memories came flooding back and filled my heart with joy as I pulled each one out– A pink bat, Bruce the shark, and a T-Rex to name a few. I digress. Back to November 1, as I sat in my chair breathing deeply, calming my anxious feeling, a peace filled my heart. I realized that I had been practicing more owning where I was in the moment and being vulnerable enough to admit it, wherever I was, even if that meant admitting I had not completed a task someone was counting on. Being was taking precedence over doing. I left the house to run an errand and ended up behind a black Mercedes that was driving slower than me, giving me another moment to pause my anxious voice and breath. As I looked closer, I saw the license plate — NJOYLIFE. Call it a coincidence, or maybe divine intervention to reinforce the space I was practicing living in more and more each day, that vulnerable, somewhat uncomfortable feeling of owning where I was, regardless of what fear arose. Regardless of what others thought. In the previous month, I had started to unravel the professional person I had become, working hard for fifteen years raising two children as a single mom. It felt unsettling and quite foreign to venture into a new season, as I clutched tightly to the leader I used to be. The consultant who would step in to help understand root causes and solve client challenges. The days of rushing out the door in the morning in a suit were a thing of the past. So who was I now? The reality was…the same person, just no longer masked by a title or something outside of me, defining who I was at work. And that was the revelation– fear had led me to not be fully authentic in my work life. Wow– what an eye opening breakthrough in this thing called my life. In that moment, I ventured forward to choose differently and further define me, moment by moment, day by day. A daily practice of sitting still in quiet and breathing first thing in the morning, even if for only ten minutes, gave me the space and the confidence to push forward and further explore the question, allowing my fear to have a voice, then choosing my story, one word at a time. The last six months have been an uplifting and challenging adventure of creating the unique me, outside of any roles I may serve. The “me” at my core. Regardless of situation. I have found Maria Shriver’s Sunday Paper to be a weekly inspiration on this path, giving me courage to keep going. Her stories are authentic and real. I am also honored to have been featured in one issue, read more here http://mariashriver.com/finding-priorities-sunday-paper/ . The reality is fear is a human condition we all experience, whether conscious or unconscious, and whether we choose to admit it or not. Fear shows up in different aspects of our lives and can be rational or irrational. Some ways I have experienced fear is emotionally –being afraid of losing a relationship, and environmentally –feeling scared of an experience playing out not as I would hoped. Regardless of how fear manifests in your life, fear gets in the way of each of us being our best self. Why not choose to dig deeper, maybe change the way we think about fear? I challenge you to try the practice of ten minutes of quiet first thing each morning, see what surfaces for you. After all, the more we shine the light on fear, the less power it wields over us. Maria Shriver’s Sunday Paper also has some ideas on changing the way we thing about fear : http://mariashriver.com/marias-sunday-paper-changing-the-way-we-think-about-fear/ . Hey Rebecca, I know your journey, in terms of the business stature you ennoyed, better than others. So glad to see you “arrive” at this point of contentment. And, Congrats on the Shriver profile.